Everyone loves a snack of healthy nuts and my Everything Bagel Almonds are just that! Savory, garlicky, oniony, a little salty, and studded with sesame seeds for even more texture. Be warned, they are addicting! Ever want to indulge on some nuts but not the sugar coating that comes with candied nuts? 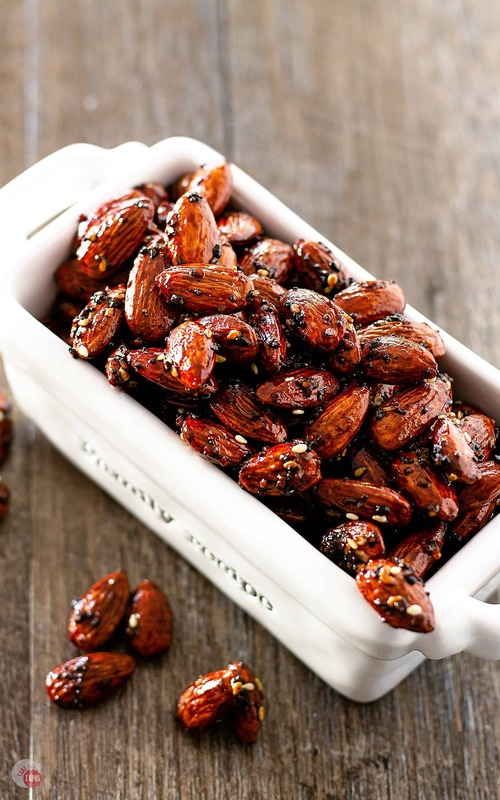 Let me show you how to get some crazy good flavorful glazed almonds without all the sugar! And on top of not having a sugary coating, how about a savory, garlicky, toasty, crispy, almond? My Everything Bagel Almonds use just a touch of sugar, but mainly use soy sauce and my Homemade Everything Bagel Seasoning! A quick glazing process and a warm nap in the oven and you have some amazing almonds to snack on! Just take me to the Everything Bagel Almonds Recipe Already! If you’d rather skip my (very helpful, I think) tips and tricks, essential cooking info, and similar recipe ideas – and get straight to this delicious easy Everything Bagel Almonds recipe – simply scroll to the bottom of the page where you can find the printable recipe card. I am a sucker for nuts when it comes to snacking. I can’t pass the bulk section in the market without going over and grabbing a few bags of raw pecans, walnuts, and almonds. Brooks loves cashews the most, but when he runs out he starts grabbing for my pecans. I have to hide them in the freezer just to be able to keep some on hand for my baking projects. Nuts are great for snacking as they are packed with nutrients but I can’t resist ones that are seasoned or candied. A crispy coating of sugar and spices on the outside of a toasted nut makes healthy snacking even better. There are a couple of ways to keep candied nuts on the healthier side such as using palm or coconut sugar instead of refined granulated sugar. Using only a tiny bit of sugar combined with other savory ingredients and flavors such as soy and fresh herbs. And, of course, making sure you are eating appropriate portions and not an entire 2-pound bag at one time. This last one might be hard to follow but you should at least try! To make these Everything Bagel Almonds, start with a small saucepan. Nothing too wide as the glaze will spread out too much and coat the pan and not the almonds. Combine soy sauce or a gluten-free alternative like tamari or coconut aminos and a small amount of brown sugar in the pan over medium-high heat. Once the sugar is dissolved, add a little of the Everything Bagel Seasoning. Bring to a boil and add the raw almonds to the pan. Stir to coat the almonds and reduce the heat to medium until the glaze is absorbed by the almonds and the liquid is all but gone. Spread the almonds onto a prepared baking sheet and sprinkle with some more Everything Bagel Seasoning. Bake for 10 minutes. Remove from the oven, stir the almonds, and spread out into a single layer. Sprinkle with a little more Everything Bagel Seasoning. Bake for another 10 minutes, and repeat the process again for a total of 30 minutes. After the last cooking session, turn off the oven, crack the oven door open, and let the almonds dry out to seal the glaze on them. Store in an airtight container for up to a week if they last that long! use parchment paper or non-stick foil on the baking sheet to keep the almonds from sticking to the baking sheet. do not use a non-stick spray as it keeps the almonds from drying out completely. have the oven preheated and the baking sheet prepared before cooking the glaze as the process moves quickly. do not toast the almonds beforehand as they will be over toasted and have a burnt taste after the 30 minutes of cooking. 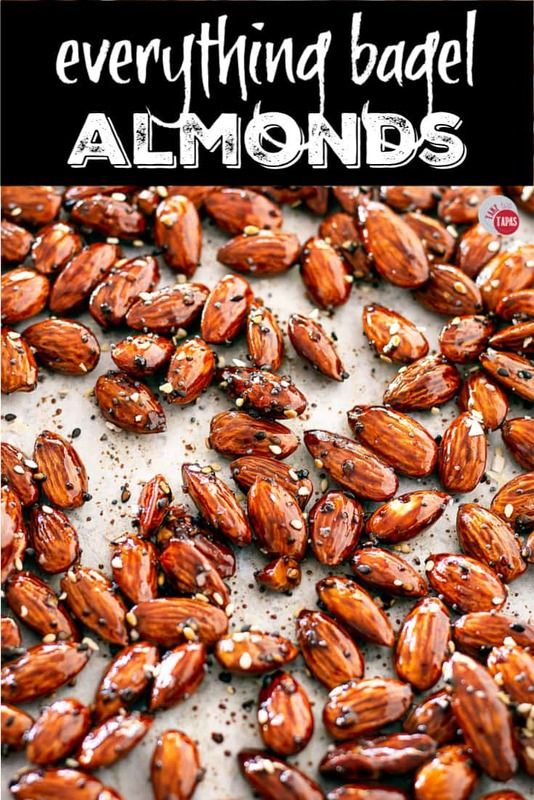 dry the almonds in the oven after it is turned off to help them fry faster. Q: Can I use white soy sauce instead of regular soy sauce? A: Yes you can but they will have a slightly sweeter flavor. Q: How long do they have to dry in the oven? A: After you turn the oven off, about 30 minutes. I like to keep mine in for about an hour to make sure they are really dry but if not make sure to stir them up in their storage container to keep them from sticking to each other. Q: Are Everything Bagel Almonds gluten-free? A: Because they use soy sauce in the glaze they are not gluten-free. If you need them to be gluten-free, you can use tamari in place of the soy, just be sure that it is gluten-free! Other great EVERYTHING BAGEL recipes to try! Looking for other seasoned nuts to take to a party you’ve been invited to? Check out all my snack mixes and nuts, both sweet and savory, to fit your special occasion! If you love this EVERYTHING BAGEL ALMONDS Recipe as much as I do, please write a five-star review in the comment section below (or on Pinterest with the “tried it” button – you can now add pictures into reviews, too! ), and be sure to help me share on facebook! In a small saucepan, add the soy sauce, brown sugar, and 1 teaspoon Everything Bagel Seasoning. Add the almonds and toss to coat. Reduce heat to medium-low and continue cooking the almonds and glaze, stirring frequently, until almost all the liquid is absorbed or cooked off. Turn out onto a baking sheet lined with parchment paper. Bake at 200F for a total of 30 minutes. Every 10 minutes, stir the almonds, sprinkle a teaspoon of Everything Bagel Seasoning, and spread out into a single layer to make sure that the almonds aren’t clumped up. Continue for the 30 minutes. After 30 minutes, turn off the oven, crack the door slightly, and leave the almonds in until they are dry. Recipe inspired by the one. Great quick snack to throw in your bag for work. These look absolutely addicting! I need to get to the store so I can make a batch!